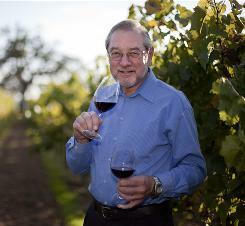 This week on California Wine Country with Steve Jaxon, we celebrate the introduction of our new co-host, Dan Berger. We are still mourning the loss of our dear friend and colleague Ben Pearson who passed away suddenly, last month, and as we have done each week recently, this show is dedicated to Ben’s memory. Steve Jaxon begins by introducing Dan Berger, the internationally known wine expert. Dan tells the story of his career, he begins when he was covering sports as a young journalist and compares that to covering wine, where in both fields, there are new competitions and new products coming out every year. He was the LA Times wine columnist from 1988 to 1996 and in the heyday of newspapers his wine column was published in over 100 papers. He has also written and published four books on wine. Tom Simoneau, longtime friend of the show, is also in the studio today, and he says that Dan is not just a wine writer, but he is a journalist. Dan’s newsletter, Vintage Experiences, has been published weekly for almost 20 years. Tom appreciates that Dan’s articles are thought-out, correct and well-researched. Dan is also a well-known wine judge, who judges for competitions all around the country as well as in his own annual competition. Steve announces that Dan will now be on the show every Wednesday. Since Dan has contacts all over the country and the world, this will be an opportunity for great expansion in the program, now running for 6 years. For more info about Dan Berger, visit his newsletter website, https://www.vintageexperiences.com/.